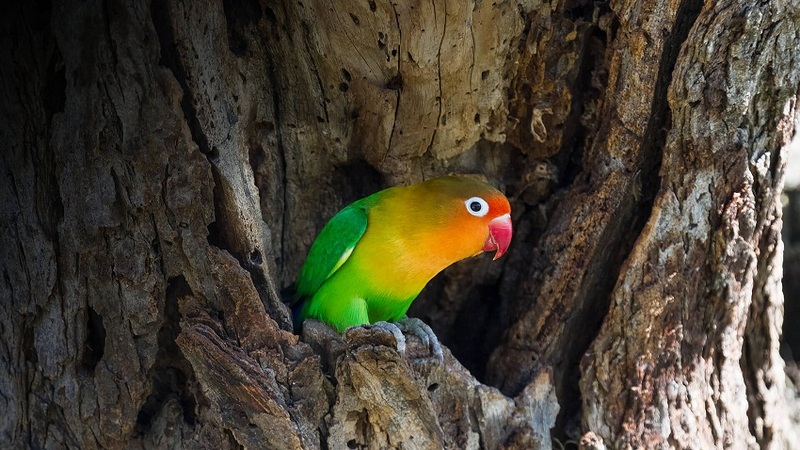 Lovebirds are pocket-sized members of the parrot family found in Africa and Madagascar. Characterized by strong monogamous pair bonds, these birds have a tendency to become depressed at the loss of their partner. While the females or hens are broader than males, the latter are smaller with bigger heads. Females also perch with their legs further apart, which helps to identify them. Male lovebirds have the habit of regurgitating food for their partners. Lovebirds can start to breed once they are ten months old. The hen lays between 3-6 eggs, around 3-5 days after mating, with the incubation period lasting between 22 and 25 days. 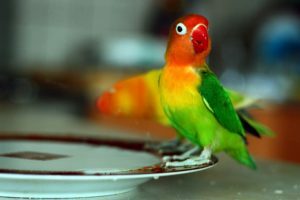 Lovebirds usually live for around 10 to 15 years under proper care. 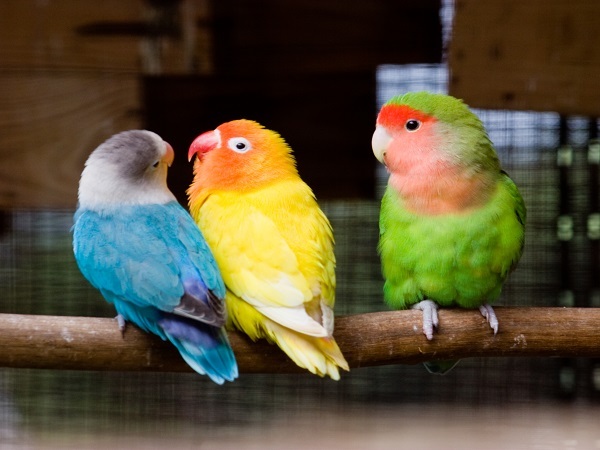 Although lovebirds are highly sought after, not all species and varieties can be domesticated. 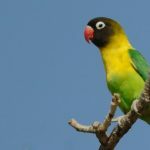 Typically the peach-faced lovebird, Fischer’s lovebird, yellow-collared lovebird, and black-cheeked lovebird are the ones suitable as pets. 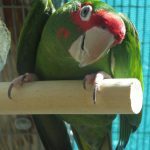 For housing a couple of lovebirds, the cage should ideally be at least 18x18x24 inches (width x depth x height), and it should have metal bars spaced no more than 3/8 inches. The perches within the cage should be around 4 inches long and ½ inch in diameter. There should be plenty of toys there for the birds to play with. 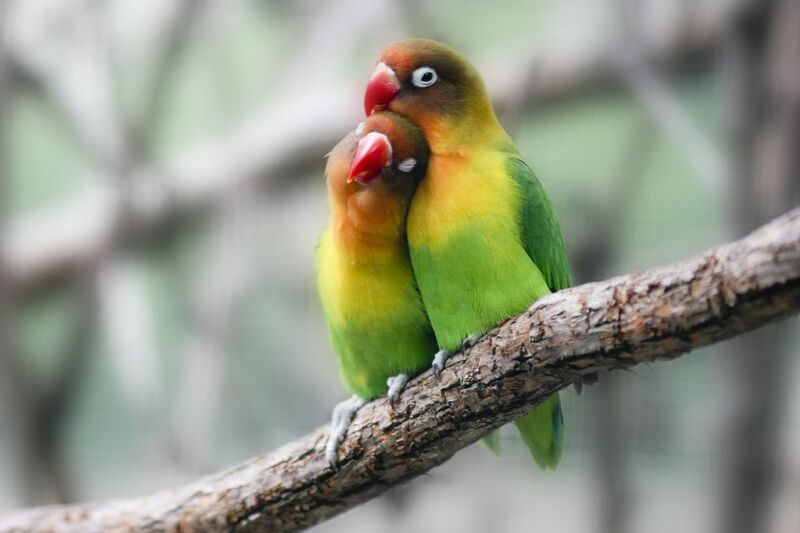 Can lovebirds live alone: It is best to keep lovebirds in pairs. 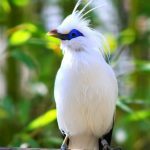 They should only be housed singly if the owner wants to develop a strong bond with bird, but in that case, maximum time needs to be devoted to the bird; otherwise, it might go into depression and engage in self-mutilating behavior. 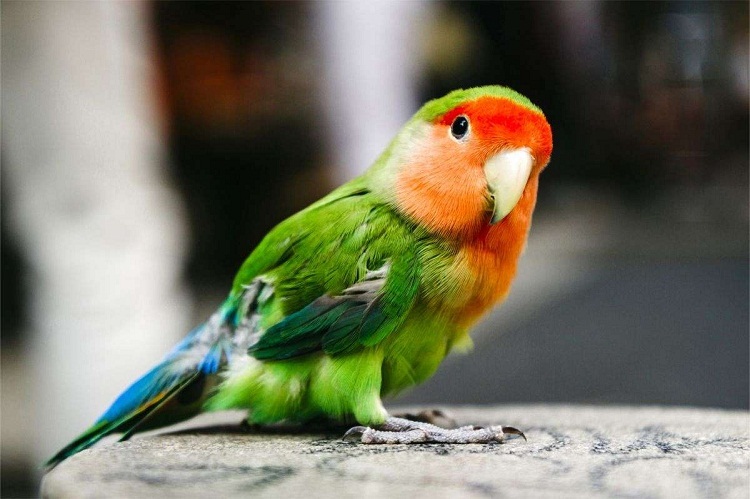 Although small, lovebirds are active, intelligent, and inquisitive. They tend to develop a loving bond with their owners, provided there is enough interaction. These ‘pocket parrots’, as they are called, can be aggressive towards other birds and animals, so a close eye must be kept while they are interacting with any other pets. 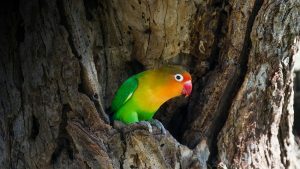 This behavior is thought to be a result of the strong bond that blossoms between a lovebird and its human, to the point that the bird is jealous and unwilling to share the company, thus becoming aggressive. Clean the cage regularly (daily or on alternate days), along with disinfecting it at least once every few month. Refill the food and water dishes every day; make sure to keep them clean as well. Replace damaged or worn out toys, bowls, and perches within the cage with new ones. Trim the nails on a regular basis to avoid injury to yourself. You may choose to clip your birds’ wings to avoid escape or injury. Talk to an expert to know the correct way to do it. In the wild, lovebirds rely on a diet of veggies, fruits, grasses, seeds, and plant material; some also eats small insects and worms. 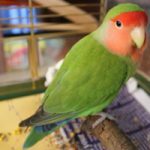 You can feed your pet birds with their regular diet in the wild, but also add a mixture of high-quality pellets. You can also offer sprouts and spinach for added nutrition. Training your lovebird can take a lot of time and patience on your part. Always remember to take small steps at a time, not to overdo the training on any given day, and always use positive reinforcement by rewarding the bird with a treat for a job well done. Never yell or get physically aggressive with it, as that might undo any progress you and your feathered friend may have made up to that point. 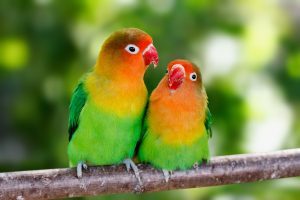 Lovebirds are quite vocal, actively singing, whistling, and chirping throughout the day. 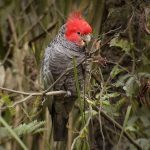 Their vocalizations tend to reach a crescendo during the dawn and dusk, but they are not as noisy as some larger birds like macaws and cockatoos. Can they talk: Not in the strictest sense of the word. As vocal as they are, they keep mostly to talking with each other. 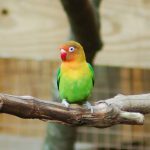 Some individuals may learn to pick up a word or two, but if you want a ‘talking’ bird, a lovebird can hardly be a good choice. Regular visits to the vet, a healthy diet, and placement of the cage in a draft-free area usually keeps most illnesses at bay. Still, there are a few problems, like diarrhea, feather plucking, avian pox, chlamydiosis, and psittacine beak and feather disease that might affect some individuals. The signs to help you recognize a sick bird are a loss of appetite, discharge from the eyes or nose, standing on one foot, soiled, fluffed, or plucked feathers, swollen beak, coughing or wheezing, and swollen eyes. 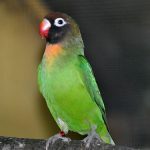 Hand-raised lovebirds cost around USD 40-130 depending on the mutation or lack thereof; however, parent-raised lovebirds are available for a lot less. Agapornis, the collective Latin name for all lovebirds, is the combination of two Greek words, ‘agape’ and ‘ornis,’ meaning ‘love’ and ‘bird’ respectively. If a lovebird pair is kept away from each other for a significant amount of time, once they’re reunited, they can be seen feeding each other frequently to reestablish their bond. Although renowned for their monogamous bond, separations do occur due to the lack of compatibility.